Udaipur: One of the most versatile actors, a brilliant storyteller and motivational speaker AnupamKher, addresses around 300 employees of Hindustan Zinc on 18th June 2018 at Hindustan Zinc Auditorium, Udaipur. “Embrace the ordinary in you. 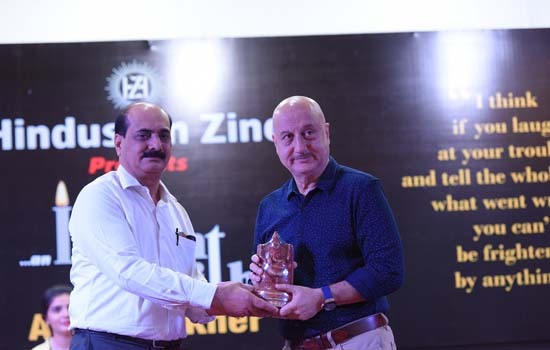 The power of failure in life will take you to heights that you could never have achieved otherwise”, said AnupamKher while interacting with the employees of Hindustan Zinc, under the Company’s initiative – “An Insight”. AnupamKher also participated in tree plantation along with CEO, Hindustan Zinc in YashadBhawan premises.